We are a leading Manufacturer and exporters of Bathtub in different metals copper, Brass, Aluminium, Stainless Steel. The same Bathtub is in copper with Antique Finish. Finish :: Inside Antique outside mosaic . ANTIQUE COPPER BATH TUB . 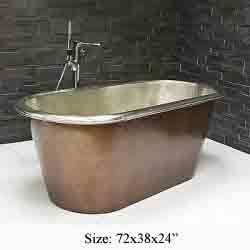 Size: L 72"x W 34"x H 34"
Being a noteworthy business enterprise, we are readily indulged in presenting to our customers Copper Bathroom Tub. We are engaged in offering a quality approved range of Bathroom Copper Bathtub. By leveraging upon our extensive market knowledge, we provide the best array of Copper Bath Tub. Size: 27.25 L x 18 W x 12.5 H in. We are a reputed Copper Bathtubs, Copper Tubs, Copper Bathtub Manufacturer, Copper Bathtubs India, Exporter and Supplier from Uttar Pradesh (India). We welcome queries for bulk orders from all over the world. Also, we ensure safe and timely delivery of our product. - Nickel Inside Nickel Outside Finish. 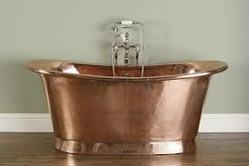 We design, manufacture, export and supply a large range of copper bathtubs in various sizes, shapes and patterns. We manufacture them by using solid copper so that the durability and sturdiness of these bath tubs is ensured. All our copper bathtubs are perfect to increase the beauty of any bathroom in houses, bungalows, farm houses, hotels and many more.